For our family the economics of going solar are entirely within reach, and we see it as a long-term investment that will pay rich dividends. I’ve dabbled in small off-grid solar projects in my backyard for a number of years, and dreamed of having a system that could produce most, if not all of our family energy requirements. I find it bewildering that the people of our “Sunshine State” of Florida are not using solar and other low-impact, high yield sources for all of our energy needs. Furthermore, I believe that widespread adoption of renewable energy sources can solve multiple environmental, economic, and political problems for our country and the world. For our family (and I believe for many others) the economics of going solar are entirely within reach, and we see it as a long-term investment that will pay rich dividends. 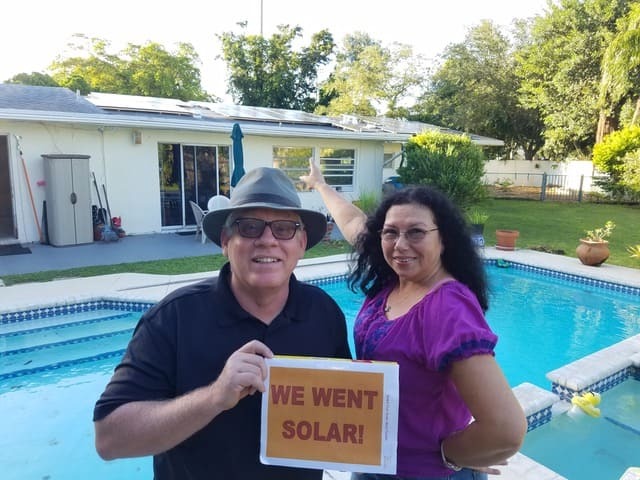 I went with Solar United Neighbors because the combination of knowledge sharing and group purchasing power they represent bring the choice to go solar entirely and comfortably within reach of most families. The main benefits of going solar have been the bargaining leverage of the group in terms of pricing for our solar solution, and the accelerated knowledge acquisition and sharing. I’m surprised at how interested, supportive, and curious people are about our experience. Mostly they want to know about the costs, and when we explain the economics of it and the quick return on investment, they are impressed and want to know more. What electricity savings have you seen since going solar? Our June/July, 2018 bill from Florida Power and Light was $89.00. In previous years it has been in the neighborhood of $300-$350. We expect even more savings with upgrades to our air conditioning and water heating systems, as well as purchase of a variable speed pool pump. Join the co-op. It is a no-strings way to learn about solar and whether it will work for your family and your home. Thank you Solar United Neighbors!! !